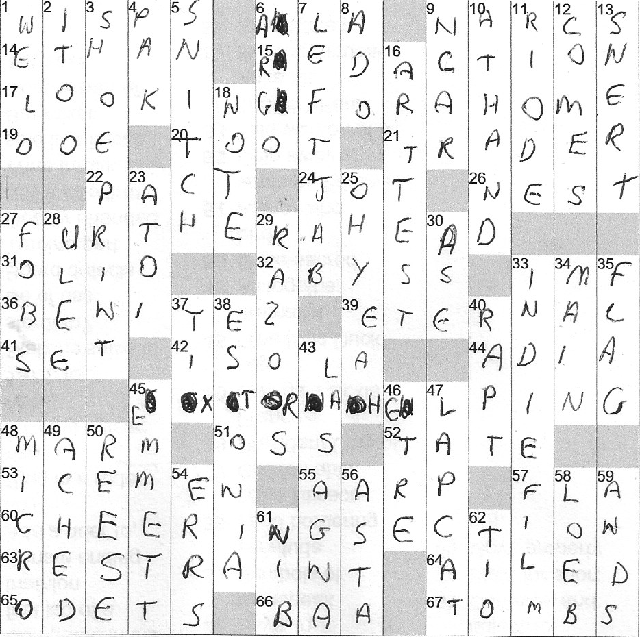 Mark your calendar for Saturday, May 30 and go register for the Indie 500 crossword tournament, to be held in Washington, D.C. You could make a puzzly weekend of it and stick around for the Washington Post Puzzle Hunt on May 31. 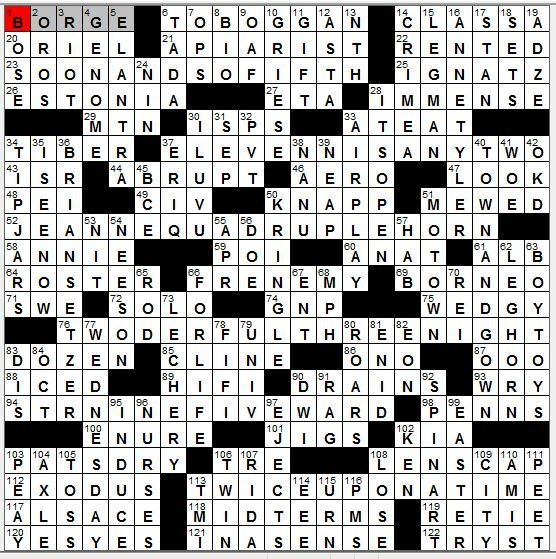 Also, if you haven’t been subscribing to the American Values Club crossword, you can get caught up by buying all 52 of 2014’s puzzles for $10 here. 17a. [Connery and Lazenby, between 1967 and 1971? ], BOND TRADERS. James Bond. 64a. [What Harrison Ford was doing in 1977, 1980 and 1983? ], PLAYING SOLO. “Going solo” and “playing a solo” sound better to me for musical purposes. Spouse suggests that “playing solo” is a video game thing. Han Solo. 11d. [1976, for Stallone’s rise to stardom? ], ROCKY START. Rocky Balboa. 29d. [Eddie Murphy, after 1984, 1987 and 1994? ], TRIPLE AXEL. Axel Foley. Odd split—half first names, half last names, and both are split halfway between name first and name last in the phrase. Last name first, last name last, first name first, first name last. 44a. [European finch], SERIN. The most crosswordese-type word in the grid, beating out the ELBE. 59a. [The same, in footnotes], IDEM. Who else plugged in IBID without a second thought? 48d. [All together], EN BLOC. The only EN BLOC usage I’m familiar with is en bloc resection of tumors. 42a. [Tiny type size], AGATE. I used to work in publishing, but books and periodicals, not newspapers. We never needed this term there, and I suspect that AGATE is far more familiar to most people as the stone, a stripey form of chalcedony. Yes? No? 3.66 stars from me for this one. 21a. [*Surgical assistant], OR NURSE. 23a. [*Means of paging doctors overhead], PA SYSTEM. Not medically specific, as PA systems abound in other settings. 32a. [*Where some wounded warriors get treated], VA HOSPITAL. 45a. [*Devices that produce virtual tissue slices], CT SCANNERS. 58a. [*Credential for some health researchers], MS DEGREE. *bzzz! * We all wanted MD here, didn’t we? Yes, surely there are some health researchers who stopped at a master’s degree. But there are people with an M.S. in accounting, too. I’ll bet there are people Googling 59d. [Glug] / DWIG (instead of SWIG) today. 60a. [*Lubricant in some doctor’s offices], KY JELLY. Also not specifically medical. A Facebook friend posted a photo of the car in front of him, license plate A KY GAL. Much snark ensued. The grid is 16 squares wide to accommodate the rows with 8- and 7-letter themers. 26a. [Quaint Aussie slang that roughly means “Oh, man!”], STREWTH. 34d. [“Offensive” nickname for the Minnesota Twins’ old stadium], HOMERDOME. 25a. [“The Valley of Amazement” novelist], AMY TAN. Certainly I know the author’s name, but I didn’t recognize the title and thought I was looking for a 6-letter A***AN surname. 31d. [Source for escamoles in Mexican cuisine], ANTS. 47a. [What Jesus will probably do if you let him take the wheel], SWERVE. Because you are on the wrong path, because he never took driver’s ed, or because it’s always iffy to have a passenger steer? 11d/12d FLU STRAIN and IAN THORPE work well, though I PUT as a partial crossing isn’t a plus. 13d. [Word bookending “Captain” and “Sally” in song], RIDE. Is this two songs or one? And is astronaut Sally Ride involved at all? 63d. [Comedian who tweeted “I’m playing the rice card” after the 2015 Golden Globes], CHO, Margaret. In the debit column, we have fill like AGER, APSES, EDOM, and maybe MYNAS (isn’t the mynah spelling more common outside crosswords?) and NEOJAZZ. NEOJAZZ wants to be awesome but I’m not sure it pulls that off. 23-A [Et cetera, after inflation] = SO ON AND SO FIFTH. Instead of “so on and so forth.” “Forth” and “fourth” aren’t the same word, but we’re Reagle-ing it, so all good. 37-A [Sporting question, after inflation] = ELEVENNIS, ANYTWO? Double-shot of inflation there, from “TENnis, anyONE?”. I got the first part but hadn’t seen the second, and had a nice a-ha moment when it finally clicked. 52-A [Supporting actress in “Basic Instinct,” after inflation] = JEANNE QUADRUPLEHORN, not Jeanne Tripplehorn. Born in Tulsa. I’d like to visit Tulsa someday. Anyway, nice one, mixing it up with non-cardinal, non-ordinal forms of the numbers. 76-A [Clapton hit, after inflation] = TWODERFUL THREENIGHT. Another double-shot that took me a minute to unravel. I do a killer karaoke version of this song (“Wonderful Tonight”) in German. 64-A [Direct, after inflation] = STRNINEFIVEWARD, from “straightforward”. This double-shot took me even longer to figure out than the others. Tricky! 113-A [Story starter, after inflation] = TWICE UPON A TIME. From “Once upon a time,” of course. Another nice variation on straight-up numbers. Fun controlled chaos theme, and the different slant each theme entry takes gives the solver several eurekas instead of just following the same pattern over and over. 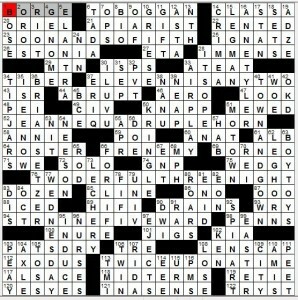 ***Lovely grid: TOBOGGAN, TOWN AND GOWN, ANNE TYLER, BRIAN SETZER, PATS DRY, WEDNESDAY, I LUV U, HI-FI crossing FIFI, TIP JARS, I SEE NOW, LENSCAP, BOY TOYS, IT’S OPEN and FOR LIFE are all things you want in a crossword. ***I’ve mentioned before how Patrick goes out of this way to conjure up clever clues for well-worn fill. Some examples here: [I.M. 68 years older than AOL] is not an instant message but architect I.M. PEI; [“The Beatles: Rock Band” consultant] = Yoko ONO; and [Cup handle?] = SOLO, as in those famous red Solo cups. Among Borge’s other famous routines is … his “Inflationary Language”, where he incremented numbers embedded in words, whether they are visible or not (“once upon a time” becomes “twice upon a time”, “wonderful” becomes “twoderful”, “forehead” becomes “fivehead”, “tennis” becomes “elevennis”, “I ate a tenderloin with my fork and so on and so forth” becomes “‘I nine an elevenderloin with my five’k’ and so on and so fifth”). So, nice touch acknowledging Borge there at 1-A. We’ll inflate the rating for this to 4.20 stars. Happy Hump Day, everybody! Although I wouldn’t call myself a gamer, I know many people personally who are enrapt in the online role-player game phenomena, and the more power to them! 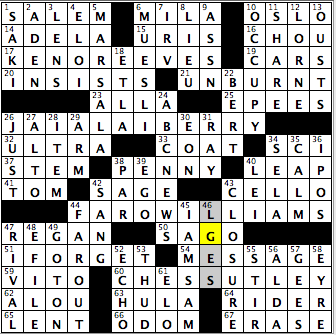 Also, the more power to Ms. Sarah Keller, who provides us with today’s entertaining crossword. 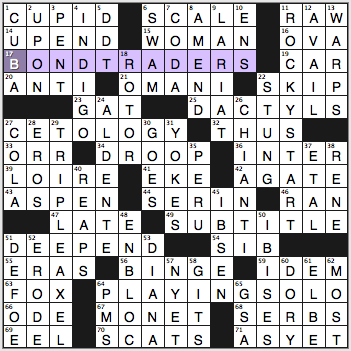 In it, each of the four theme answers are actual celebrities whose first names are converted into a similar-sounding word(s) that also happens to be a sport. With that, would the actor who played Ivan Drago in Rocky IV who also happens to shoot a few rounds on the links be GOLF LUNDGREN? Or maybe the Harry Potter author who spends her time at the lanes is J.K. BOWLING? KENO REEVES (17A: [“The Matrix” star, as he’s known in lotto-like gaming circles?]) – From Keanu Reeves. JAI ALAI BERRY (26A: [“Extant” star, as she’s known on the fronton circuit?]) – From Halle Berry. Was impressed with this conversion! FARO WILLIAMS (44A: [“Happy” singer-songwriter, as he’s known to wagering card game bankers?]) – From Pharrell Williams. CHESS UTLEY (60A: [Phillies second baseman, as he’s known to rank-and-file gamers?]) – From Chase Utley. An actor, an actress a musician and a ball player as the four themes pretty much makes for perfect pop culture balance. Seeing the whole of ABC NEWS right down the middle of the grid was a pleasant sight (24D: [“Nightline” provider]). This grid was also an ode to the answering machine, with both MESSAGE (54A: [Answering machine playback]) and ERASE being entries (67A: [Answering machine button]). Of all the chicken dishes that I’ve made, I have yet to use MARSALA when creating my chicken dinners in the kitchen (5D: [Wine used in preparing a veal or chicken dish]). That has to change soon! Here’s a challenge: find someone who, when describing something really good, still says FAR OUT (44D: [“Awesome!”]). I’ll give you some sort of prize if you’re able to find him/her and have the person say it to you! Ready? Go! “Sports will make you smarter” moment of the day: ODOM (66A: [Khloé’s estranged husband Lamar]) – A number of people know Lamar ODOM for being a Kardashian by marriage, but, for sports fans, they know him as the New York City native who became a high school legend at Christ the King High School in Queens before leading the University of Rhode Island to the NCAA Tournament in his only college season in 1999 (after he was dismissed from his original college destination, UNLV) and becoming an NBA Sixth Man of the Year award winner and two-time NBA Champion with the Los Angeles Lakers (2009, 2010). Oh, and for those who are into this sort of thing, he’s left-handed. Have a good day, everybody! See you tomorrow! Three RAHs are hidden in the longest theme answers. This is tied together by CHEERINGSECTION. 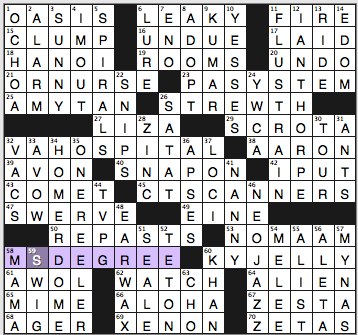 RAH is mostly a dictionary/crosword phenomenon, but there’s nothing wrong with a sly wink to crossword stand-bys! [Seeking lodging], LOOKINGFO(RAH)OME. Seems a bit iffy as a specific phrase, outside of the song Boll Weevil. [More at dinner], EXT(RAH)ELPING. I failed to count properly and tried SECONDHELPING. [Editor’s job], REDACTION. High-end vocabulary. In Afrikaans redakteur is the common word for editor though. [Mexican supermodel Elsa], BENITEZ. Unknown name, but a common enough Spanish surname. [Liverpool manager Rafael] would’ve been more in my wheelhouse. [Suffix with school], MARM. That’s stretching the definition of suffix! [London home of Constables and Sargents], TATE. Spelling and capitalisation made this rather transparent! [Nearby], ATHAND. Spotted the trap early! Can be TOHAND just as easily. [Evaluation for creative types], ARTTEST. Is this something more specific than just a test on art? [“Now I remember!”], OHYEAH. Chicka-chicka! [Suffix with malt], ASE. Another trap! Maltase breaks down maltose. [Clown Kelly], EMMETT. Only vaguely familiar to me. Seems to be notable enough though. [Purring snuggler], LAPCAT. I only see this in crosswords. LAPDOG seems useful as it distinguishes itself from Boerboels and Neapolitans and the like (Great Danes haven’t been told they’re not LAPDOGs though!) But surely all cats fit on LAPs? 3.25 Stars. Solid if a little bland. This entry was posted in Daily Puzzles and tagged Byron Walden, Don Gagliardo, Jeff Stillman, Patrick Blindauer, Sarah Keller, Tony Orbach. Bookmark the permalink. NYT: loved learning about Fiasco! I’m cleaning out my study at home and found a book and cd about learning Italian, which I have no memory of purchasing or receiving. I must have wanted to at one point, and now I want to again. I’m convinced it will be fun and not too hard (at least more realistic than my learning Japanese, which I entertained ever so briefly). May be when I retire… A friend told me that when you retire you should plan to have areas where you can be sure you’re improving, so you’re not just hanging around watching everything decline… So, a little Italian, a little Chianti, and a fiasco seem in the offing. Puzzle zipped along like a Tuesday. Italian is said to be the most logical language and the easiest to master as evidenced by the fact that there are fewer dyslexics among those whose primary language is Italian. I think there are fewer sounds to master. I honestly can’t remember the last time I saw a bottle of chianti in a FIASCO. Most of it is packaged like any other wine. I stayed in the region for a while a few years ago and it was amazing. I would move there in a heartbeat. LAT: 16-D, did anyone else read “Evolution for creationist types”? AV – Astronaut Sally Ride is not involved in the songs. Unless they’re different from the ones I’m thinking about. Mustang Sally and Ride Captain Ride predate her public life. 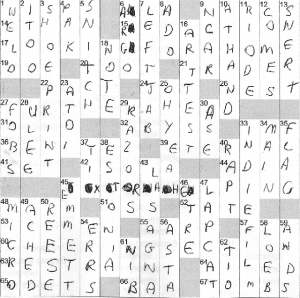 Does anyone else have trouble getting the bottom rows of the L.A. Times and CrosSynergy puzzles to print? They’re the same kind of site, and everything else prints normally. I’m solving for speed, so ideally I won’t have to hand-write the clues and grid before I start timing. Blindauer: what is the old testament book KAB? it’s HAB for the Book of Habakkuk.